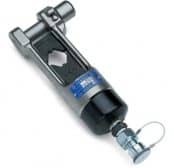 Should you require any technical advice or support to select the correct hydraulic pressheads for crimping cables please do not hesitate to contact us – see our full range of hydraulic or battery type cable cutting and crimping tools. Cable crimping heads are available to effectively and safely crimp all types of LV MV HV underground cables and overhead line conductors with cross section areas up to 1200sqmm. Presshead type tools manufactured by Cembre are also available for cable cutting applications. We can provide expert recommendations for the correct type of cable crimping using hydraulic or battery type technology.